I’ve said it before, and I’ll say it again: oversized jumpers are one of my ultimate wardrobe staples. Seriously – I wrote a whole post as a love letter to them once! 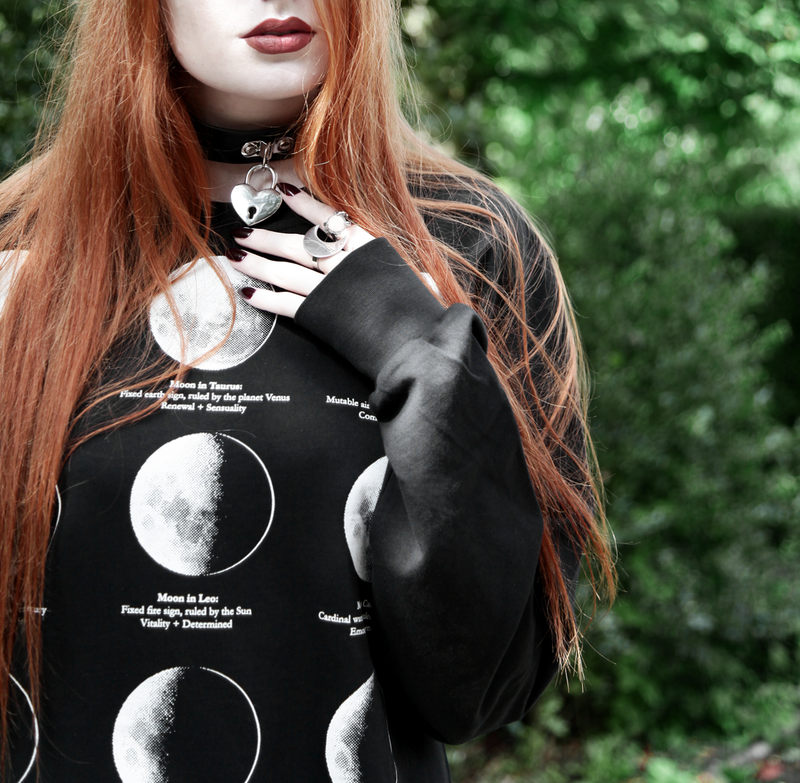 This Killstar jumper is fab for keeping cosy – the fleece-lined sleeves reach past my fingertips and I feel all cocooned and snug. I absolutely adore the design as well – moon phases are beautiful, and it’s fun trying to pick out my friends/family’s star signs on the print! In that way I guess it’s a bit of a conversation piece too. I always find that my friends or work colleagues that haven’t seen it before get me to stand there while they pick out their particular moon phase! Styling-wise, I paired the sweater with a patent skirt underneath, just to add a little peek of shine and a different texture. Then I added my oversized fishnet tights (with sheer skin-colour tights underneath so I wouldn’t freeze! ), and ‘no fun’ socks… because it’s okay to be not-so-fun some days! These socks are now one of my running jokes for those nights where I don’t fancy staying out, instead preferring to go home and curl up in bed with pizza :3 (lame, right?). HEY – it may be less fun to some, but it’s fun to me anyway! What do you love to do that others might consider ‘no fun’? Organisational lists and early nights are kind of my thing at the moment – clearly I’m an 80-year-old trapped in a 23-year-old body! Previous Post 20% off Asos Discount Code – Top Picks. Love the idea of the patent skirt underneath! Hell yeah to massive jumpers! I love love love this one! The tights with it are so cool, they really add to it! Let’s just have a talk about those shoes! Errr they are amazing!! They are so beautiful! Thanks so much Evelien! It’s got super chilly in the past week now – definitely time to wrap up in this jumper (but maybe with jeans haha) Hope it’s not too cold in Holland though! I seriously love your dark style Olivia! Ahh, thank you so much beautiful! This is great. I love moon stuff. I also find organizing fun & lists. When I stressed out or upset, I start cleaning or organizing.